A few years ago, while visiting our family for Easter, Dara and I decided to raid our mother’s kitchen, and dye hard-boiled eggs with whatever we could find that we thought would give off color. We didn’t do a whole lot of research into the technique of this, but I will say, the results were not half bad. This year, I found my self a little further away from home, and for the first time, not with family. I remembered the dozens of eggs my Noni would make for us each year (a dozen alone with my name attached) and thought back to the dye experiment with Dara. This time, I did a little more research, and came across a better formula, and some ideas for different materials to use. I decided to go with cabbage, beets and tea and used a mixture of white and brown eggs. 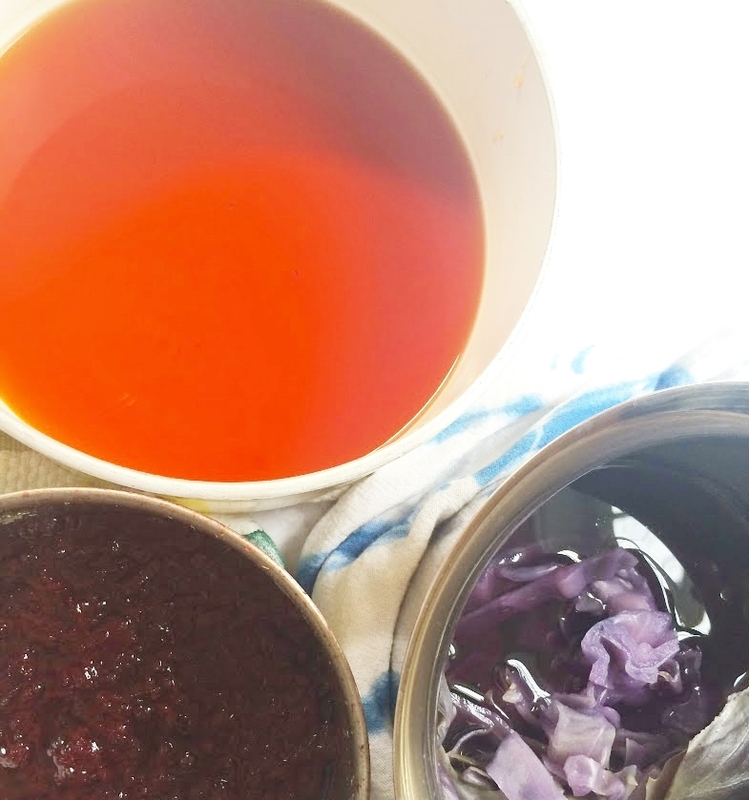 To make the dye, simply combine equal parts of each dye matter (cabbage, beets, etc) and water in a saucepan (with the exception of the tea which should be 1 bag to each cup of water), and bring to a boil. Simmer for 30 minutes, and let cool to room temperature. Most blogs I found with tips for this project felt that 4 cups of dye per dozen eggs would be sufficient. I had three eggs for each color, and made about 1.5 - 2 cups of dye per color. Once cooled, strain the liquid through a mesh strainer into another bowl and add 1 tablespoon of white vinegar to every cup of liquid. Because some of these dyes are potent in their coloring - especially the beets - I used various glass jars for the dying process, to ease the cleanup. I will say that the tight spaces these jars offered caused some spotting on the eggs, so it is recommended to use a baking dish to allow the eggs to be in one layer. 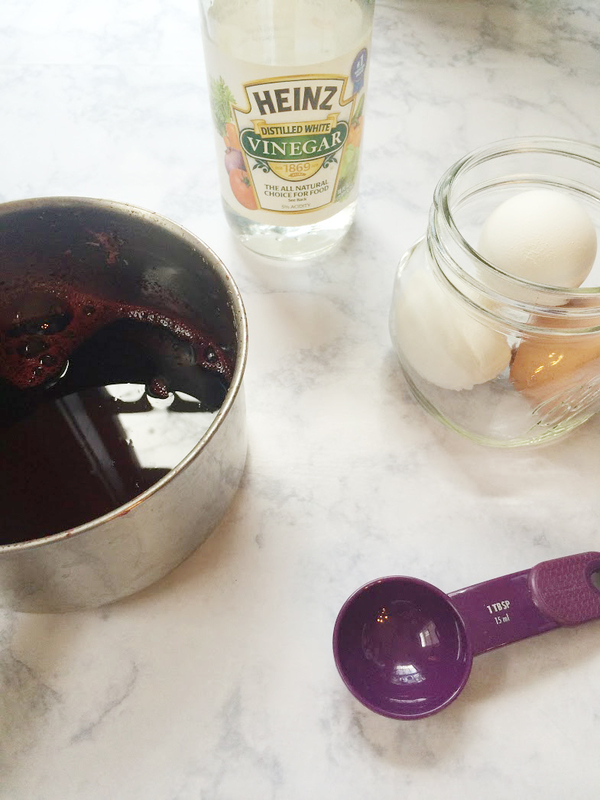 Place the eggs in whichever containers you’ve chosen, and pour dye over, making sure the eggs are completely submerged. Place the containers of eggs-in-dye into the refrigerator overnight and gently rinse once desired hue is reached. I absolutely LOVE the colors that were produced. The cabbage reminds me of indigo dye, and the tea was almost marble looking. The beets, while didn’t make very red looking eggs, made the egg whites pink! And while easter egg dying may be "so last week", you can take these natural dyes and play around with some dipping paper or fabric....a natural dyed spring scarf would be gorgeous! Before you start the dyeing process, you’ll want to prep your fabric. First, wash the fabric. Don’t dry it though – it needs to be wet. Then prepare your fixative or “mordant.” This is to help the fabric take up the dye more easily. For berries you’ll want to use salt and for any other plant material, you’ll want to use vinegar. Place your damp fabric in the fixative solution for an hour. Rinse with cool water when done. Then, it’s time to dye the fabric. Before you start, cover the surface of your work area and be sure to wear gloves so you only color the fabric, not your countertops and hands. Then, prepare your dye. Place the plant material in a large non-reactive pot (like stainless steel or glass). Remember the dye could stain some pots and spoons, so use these only for dyeing. Fill pot with twice as much water as plant material. Simmer for an hour or so, until you get a nice dark color. Strain out the plant material and return the liquid to the pot. Carefully place the fabric in the dye bath and bring to a slow boil. Simmer for an hour or so, stirring once in a while. Check your fabric. Remember, it will be lighter when it dries. An hour should produce nice color, but darker hues can be achieved by allowing to sit longer, even overnight. Turn the pot off after an hour and allow fabric to sit in the warm water as long as needed.